Beginning after September 1st, 2017, Siborg is offering a new multipurpose device, the LCR-Reader-MP. This device has a basic accuracy better than 0.1%, a 100 kHz test frequency and more features than Smart Tweezers ST-1. 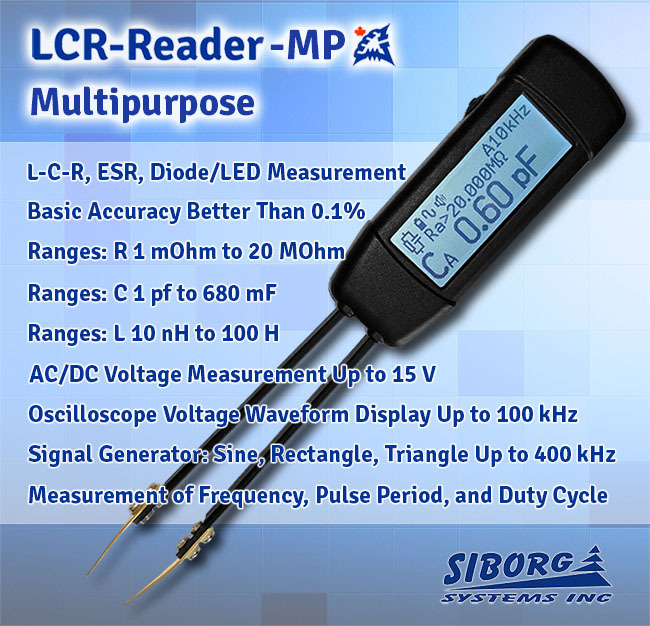 The LCR-Reader-MP offers many features and measurement modes, including AC/DC voltage measurements, signal generation, oscilloscope mode, pulse counting, frequency measurements, LED and diode testing and more. One of the most important features of the device is the 100 kHz test frequency that allows for 1 nH resolution for inductance measurements and 0.01 pF for capacitance. The new device is especially helpful when testing large capacitances up to 680 mF using the ‘Large Capacitance’ mode. This will allow electrolytic capacitors to be measured at 120 Hertz with the ESR being measured at 100 kHz according to the regular electrolytic capacitor test conditions. When using the ‘Large Capacitance’ mode, the device will automatically reduce the test frequency to 25 Hertz which allows for reasonable accuracy. The device also offers a wide range of test frequencies for the best results depending on the task; these include: 50, 100, 120 Hz, 1, 10, 20, 30, 40, 50, 60, 75 and 100 kHz. The LCR-Reader-MP features an oscilloscope mode for analyzing voltage wave forms with frequencies up to 100 kHz on an active circuit board. This mode is very useful when used in conjuncture with the LCR-Reader Kelvin Probe Connector. The Probe Connector extends the reach of the multimeter, allowing for components larger than the tweezers’ spread to be measured and allows to check wave forms at various nodes on the PCB. The device does have some downsides: a rather high test signal source resistance of 1 kOhm and a maximum test signal of 0.65 Vrms which is not enough for reliable evaluation of some ceramic capacitors which can result in lower than actual capacitance values. LCR-Reader-MP is slightly larger than LCR-Reader and Smart Tweezers; at 2 oz., it is twice as heavy and is almost double the width. Though larger, the MP device features a larger screen with better readability. LCR-Reader-MP will be available after September 1st, 2017. Siborg is offering an introductory price of $388.99 USD and will be taking pre-orders. The devices will be shipped as they become available.